Marie-Andrée Laroche, an exercise specialist for the Personnel Support Programs who is involved in Phase 1 (injured members) of the Training Reintegration Program at the Canadian Forces Leadership and Recruit School (CFLRS), in the company of Captain Carole-Anne Dufour, of 41 Canadian Forces Health Services Centre Saint-Jean, during a presentation of the results in Regina. Marie-Andrée Laroche, who is an exercise specialist with the Personnel Support Programs (PSP) and involved with Phase 1 (injured members) of the Training and Reintegration Program (TRP) at the Canadian Forces Leadership and Recruit School (CFLRS), has been leading a study of injury patterns among recruits and officer cadets. A few years ago, noticing the significant number of injuries that candidates suffered, Ms. Laroche took the initiative of compiling data on the subject. She and Captain Carole-Anne Dufour, a physiotherapist, presented the results analysis in mid-October during The Canadian Institute for Military and Veteran Health Research convention. Ms. Laroche has been developing a database since 2014 made up of a sample of over 10,000 entries. This is the first study to be conducted involving recruits and officer cadets within the Canadian Army. Among other things, this large-scale study has revealed that the frequency of injury is 3.5 times higher among recruits than among officer cadets (7% and 2% respectively). At the time of their arrival, women make up 16 to 19% of the members of a platoon, but they make up 38 to 40% of Phase 1 candidates. As for the type of injuries that people suffer, 70% are lower body injuries, and 58% of those are due to accumulation (walking, stairs, basic drill, running, etc). There is also a link between having a higher score on the FORCE test and having a higher rate of injury. Given these results, Marie-Andrée Laroche maintains that it is essential to prepare future candidates as soon as they register at the Canadian Armed Forces recruiting centre, and to promote interventions to prevent injuries. - There is no difference in the total number of steps taken, despite candidates’ lower body restrictions. Note that the tool used is not very precise, but it provided an overview of the situation. Other analyses with a more reliable tool will be conducted soon. Would be nice to see the whole study. Also interesting is the link between having a higher (be "fitter") FORCE test score, and a higher injury rate. I wonder if they looked at whether the higher score individuals were doing more PT than the lower scored pers (who physically couldn't complete as much PT), or just left it open ended. Would be interesting to see the injuries categorized as well between healing over over the duration of the course, requiring an individual to be recoursed, and career ending. Also interesting is the link between having a higher (be "fitter") FORCE test score, and a higher injury rate. I wonder if they looked at whether the higher score individuals were doing more PT than the lower scored pers (who physically couldn't complete as much PT), or just left it open ended. That's quite the assumption. Maybe they just didn't want to do as much PT. My guess is people who are "fitter", do more PT and by doing more PT they are subject to more injuries. Or maybe the fitter people just tough it out when they do get an injury and make it worse. Futher to that I’d also argue that “PT” is far too general. (Personal PT in addition to unit) There are those who focus primarily on certain types of PT and those who focus on others. (Not to mention body type, height, weight etc etc.) I’ve seen individuals whose regular PT regimen is fewer times/wk than that of others, but who had better scores on the FORCE simply because they were faster. All individuals were easily considered “fit” in every sense of the word though. My guess is people who are "fitter", do more PT and by doing more PT they are subject to more injuries. Thats literally what I said.... fitter people are doing more "reps" during course PT, and that "extra time" exercising causes more injuries. I think mine is a far safer assumption than fitter people conceal injuries and make themselves worse. Obviously we don't have any of the data of the study, so we can't pick it apart properly. The problem is, they might have gone and proved the FORCE test is a poor predictor of general fitness or ability to resist LBIs on BMQ. I'm not very mathy, is that study suggesting women are disproportionately injured more than men? There is also a link between having a higher score on the FORCE test and having a higher rate of injury. Surprised to read that, I'd have expected the opposite. In my limited experience the majority of lower body injuries I seen were from people over weight or out of shape. With a number of them I suspect faking injuries in order to get out of pt. More often than not, based on what I've seen and experienced, the injury rates for soldiers (or any human) increase where there isn't alot of thought or science put into how the 'ramp up' period is managed. For example, putting a big ruck on someone who's nowhere near ready physically, or mentally, to do a long march with alot of weight on is never a good idea, even if it's in line with certain 'macho' - or organizationally institutionalized - concepts of how to lead battle PT. If you try to apply a cook book, off the shelf PT solution to any group of fitness neophytes, you're bound to take some casualties. The questions is, of course, is to what extent that's acceptable. My sense is that, as the quantity of qualified recruits declines, the more we need to pay attention to our qualitative approach to fitness training. I am a regular swimmer and the natural bent is to try to get better at your athletic activity. This also means being aware of how the body is responding to the extra pressure on your body parts. I know swimmers have issues with their shoulder and upper arm. I would expect other activities have their own physical challenges. Disregard a reply I made to you...I clearly read too quickly the first time over. That's exactly what's being said, women make up a disproportionate number of injured recruits. This holds true throughout their careers and across a wide spectrum of trade choices. More women need to take an interest in fitness and in particular strength training to handle the stresses the military puts it's people through. Fitness? I don't think that's a woman/man issue. Strength Training.....I could agree to that. My knees hurt all the time when I was younger. When I got out I added weights to my regime and sore knees went away....and still don't hurt to this day. Arthritic hip sure does .....but neither of those types of exercise will help that. Women on average perform worse in tests of physical fitness than men in the military. Given that tasks assigned are done so (at least in theory and usually in practice) without concern for gender or size, it's easy to conclude the smaller weaker person will incur more stress. One can even say that women need to put more emphasis on fitness training than men, given that men perform at higher levels in untrained individuals. They're at a disadvantage from the get-go and need to work hard to overcome it. They perform worde in fitness tests or actual assignments in real life situations? ? Gauging peformance in performing their duties physically is difficult, but we do know they accumulate more injuries, limiting their ability to continue performing at the same level as their peers. Take rucking for example, it was found women are injured 2.4x more often and their level of injury was considered serious 2.5x more often than men. All the more reason to have something available that is more sophisticated than the typical 'one size fits all' fitness program. I think it could also be beneficial if they were to dig into patterns within certain platoons. I've heard first hand about how different Pls have different "intensities" based on their DS and that certainly will affect injury rates as physical activities outside the official training syllabus are layered on. Absolutely it needs to be tailored to the individual, the question is how do we apply that in places like BMQ? My answer is physical testing prior to getting to St Jean to give the best shot at success in a group. It is a gender thing for 9x% of individuals, there will always be outliers. When you get women up to the same fitness level as their male peers, the injury levels even out and there is no statistically significant difference. The reality is however most females do not achieve these levels, a late 20's female who achieves platinum on her Force test would only score bronze in the male category. Very very few achieve the same standards as fit males in strength, this is where the training focus needs to be. Yup. BMQ DS do not necessarily have the knowledge or skills to properly develop recruits physically, so probably need some training themselves, as well as making sure that properly qualified staff manage/ lead more complex programs. I've run hundreds of recruits through training but never had one minute of training myself in anything related to physical training science or practice. We were just expected to follow the program pick it up along the way, unlike most everything else we trained people for such as navigation, skill at arms etc. Very very few [females] achieve the same standards as fit males in strength, this is where the training focus needs to be. Curiosity: why does the focus need to be on strength? 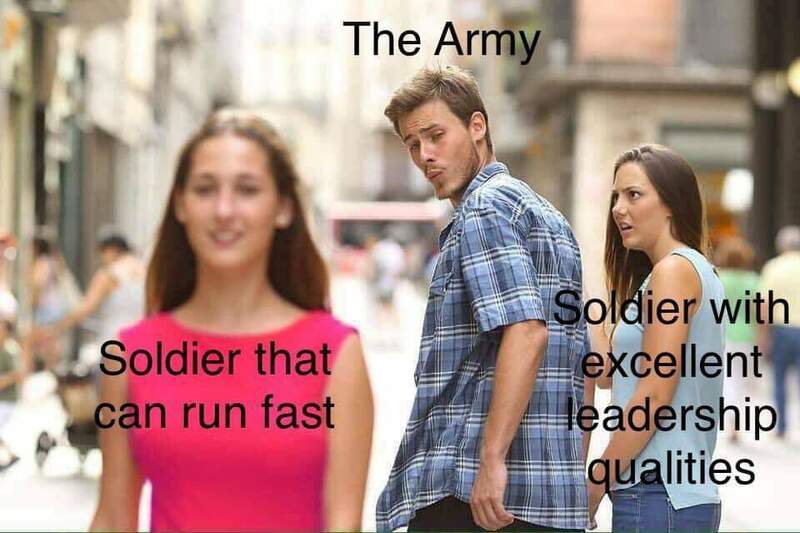 Once upon a time, I was in a regiment that had no shortage of guys who could bench-press a truck.... but we seemed to spend an awful lot of time running -- and not sleeping -- usually in swamps. Rucking was pretty common in filling out morning PT too, but once in the field, having gotten to 'Point A,' everyone emptied all the support weapon ammo and radio batteries out of their ruck, which tended to get ditched at the RV; spare kit: dry socks, fleece, toque/bug net went in pockets not filled with pers ammo. Because strength along with structural differences between the genders are often the biggest bridges to gap. Aerobic capacities once trained become more similar, however even in trained females the strength differences are still significant. Even once those rucks are stripped down and you're walking around with 40lbs, the male who's now walking around with a ruck that is at 1/6th his max squat capacity is going to work much less than the female who's is at 1/4th her's, this directly translates to alleviated stress accumulation and in turn less injury. Even running has a strength component to it, both in providing momentum and reducing stress. There's a reason nearly every trip to a physiotherapist has you leaving with a list of exercises to accomplish, strength training is pivotal in overcoming and prevent injury. I'm not suggesting women try and get a 225lb bench press, but I am suggesting they get a 225lb squat. They need to build functional strength levels that their peers are already at. The last leadership course I taught on had a checked out psp guy give classes on the proper way to run a pt session the students had to pass a Po check running a pt session. Worked in theory. In practice a little bit of the value was lost because the whole course was tested over two days and it was just a meat grinder back to back 20 minute pt sessions. Still I thought the instruction was pretty good. I think I'd like it if we had what the British army still has and our own pt instructor trade.